I've just noticed that when I search for articles on my website in Google, the name of my website has been replaced with 'behance'. I have no idea who/what 'behance' is and how to correct this problem. 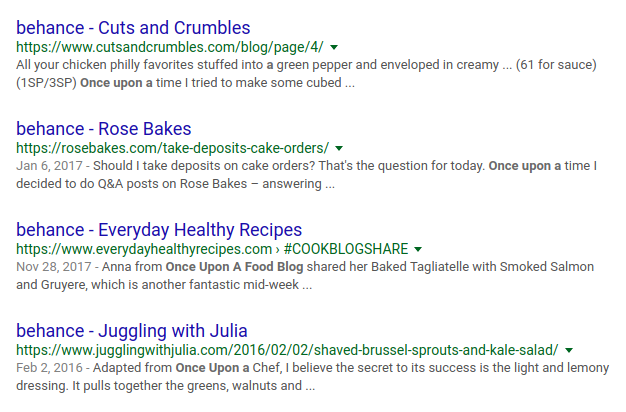 When I look at the page source, the name of my website (Once Upon a Food Blog) is there. If I search for 'behance' in the source code there are no results. 'Homemade Cloudy Lemonade - behance' instead of 'Homemade Cloudy Lemonade - Once Upon a Food Blog'. Can anyone explain why this might be happening and how I can fix it? I contacted John Mueller at Google about this issue. He had his team take a look at it and got back to me with the answer. Google is incorrectly picking the title from this image as the brand name of your site. I think that Google looks for images used on the home page to try to determine the brand name. Google is probably looking for logos. or disallow the image in your robots.txt file. After you have done so, use "Fetch as Google" in Google Search Console against your home page to get site display updated in the Google search results. What's happening here is that we're (unnecessarily :)) picking up a title from a SVG that's used on those pages ( https://onceuponafoodblog.com/wp-content/plugins/simple-social-icons/symbol-defs.svg ). So obscure :). It's useful having an example like this, thanks for passing it on! 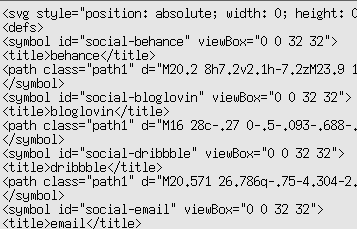 If they want, one fix is to robot out the SVG and request the homepage be recrawled & reindexed in Search Console. Behance is a network of sites and services specializing in self-promotion, including consulting and online portfolio sites. If you (or someone) has added your site there, then it is likely that Google search has discovered your site through that portal and is kind of acknowledging that. Not the answer you're looking for? Browse other questions tagged google search title or ask your own question.